The Eiffel Tower is among the world's most famous structures. By all means, go see it. Take pictures of it. Tell your friends you stood at the base and looked up into the tower itself. But don't kill large periods of time waiting in line for the ride to the top. Eiffel Tower ticket prices for the top are €25 ($29.25 USD) for adults, €12.50 ($14.60) for ages 12-24 and €6.30 ($7.40) for ages 4-11 (under age four ride free). If you're willing to walk to the second level, these prices are more than cut in half. Note that you cannot walk to the very top observation level. For those taking the elevator, this is a one-time experience you're likely to remember. When viewed that way, the costs aren't excessively high. But the investment in time you will make waiting in line for those elevators could kill a significant part of your day, depending upon the time of year. It's worth deciding before arrival whether or not you want to make this investment. 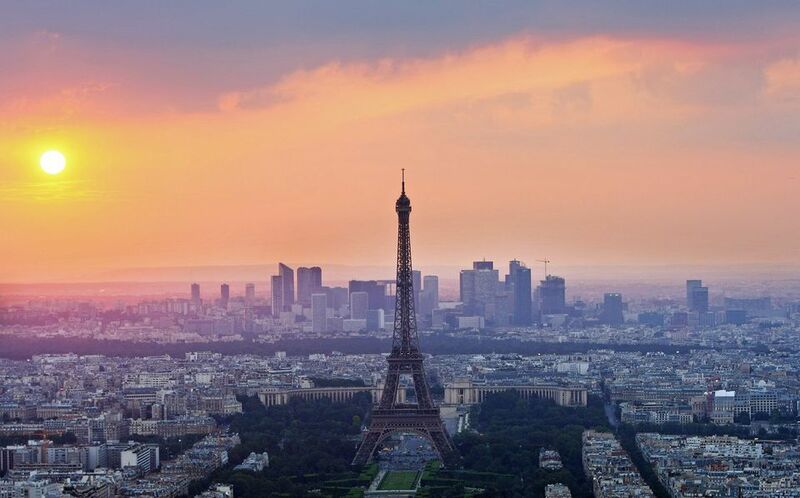 If you simply want a great view of Paris, there is a much cheaper way to go. Sacre Coeur is another Paris landmark, slightly less familiar than the Eiffel Tower. It is a Basilica perched on a hill that offers a commanding view of the city. Take the Métro green line train to the Abbesses stop. From there, it's a short walk to the Montmartre funicular (two-cabin railway). The Paris Transit Authority operates it, so a Métro ticket or a Paris Visite card will get you there for very little money. This is one of several great Paris experiences for which you pay only transportation costs. You can sample free things to do in Paris, take a look free Paris museums and a long list of free Paris events. Confusing the Métro and RER trains, which run underground through the center of Paris, is the first mistake. The RER is more of an express train that makes less-frequent stops and serves a wider area that includes the Paris suburbs. The Métro is for shorter runs within the city. When you buy a train pass, be certain that you know whether or not you are covered for both systems. Although operated by the same authority, your pass might not cover the added zones RER trains typically reach rather quickly. Failing to take advantage of one of the world's best mass transit systems is the second mistake. Don't even think about driving here unless you are entering or leaving town. It has been said that no point within the city limits of Paris is more than 5-10 minutes by foot from a Métro station. Believe it. Most of the places you'll want to see are convenient to a train stop. You can purchase a variety of Paris Visite transit passes that fit every budget and itinerary. A five-day pass is €39.30 ($44 USD); a one-day pass starts at €12.30 ($14). Note that Paris Visite is valid from the first day it is used to the end of the last day of the pass chosen. The day begins at 5:30 a.m. and finishes at the same time the following day. Finally, failing to set up affordable airport transportation. Buses run between the center of Paris and both major airports at one-way prices of €12.10 ($14). Unfortunately, many tourists use one of two approaches to eating in Paris: they excessively overspend their budgets for food, or they skip eating nice meals altogether and opt for fast-food meals. In our experience, the food in Paris is expensive. Notice we did not say overpriced. The quality of everyday food here is above what you find in many other places. We once unwrapped what we thought was an expensive brownie in Paris until we took the first bite. Quality ingredients made it well worth the price. Don't miss out on French cuisine -- it's part of the reason you visit a place like this. Just realize that you need a plan to keep costs in check. Maybe you can have your big meal at lunchtime when menu prices are about half of what is charged at dinner. Paris is also famous for the prix-fixe option that allows you a three-course meal for one price. It's often cheaper than ordering a la carte. A guiding principle that will help you avoid paying too much is this: order what the locals eat. Bacon and eggs for breakfast (when available) is going to cost a lot more than what the French typically eat -- a pastry and some coffee. Likewise, soft drinks with American brand names often come at a premium. French menu prices include a gratuity. You'll be paying for service -- good or bad -- whether you like it or not. So don't leave another 15-20 percent tip unless you want to make a statement about exceptional service. You'll see pocket change on the table sometimes as a party leaves. That's because Europeans typically round off their tabs by leaving small change for the help. For example, a bill that comes to €12.50 might be paid with €13, leaving the change for the server. But you would not leave the server an additional €2 - €3 as a tip. If you find yourself taking a taxi, practice a similar policy. Round up to the next Euro. 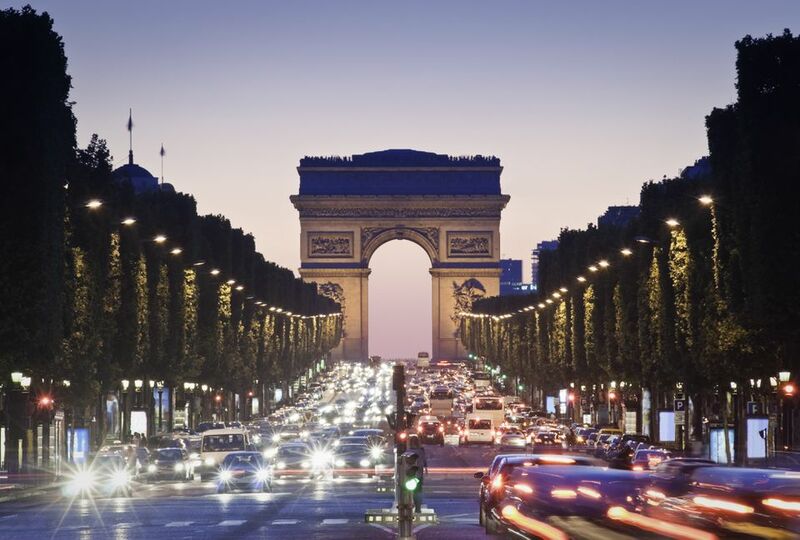 Budget travelers often focus on two- and three-star hotels for their stays in Paris. You'll see quite a few of these, with a sign that shows the star rating and whether or not there are vacancies. There can be wide variations in the quality of these establishments, even when they have the same star rating. There are two-star hotels that are nicely equipped, clean and well-located. There are others at which you would not want to spend the night. So don't become too reliant on the star system. Booking blindly using this as the only guide can result in some disappointing accommodations. That cluster of high-rise buildings off in the distance is known as La Défense. It's a section of Paris where business travelers attend meetings and use very nice (if somewhat ordinary) hotel accommodations. Many travelers consider this area "too far out" and lacking in character. Depending upon your circumstances or tastes, both of those statements could be true. But La Défense offers some excellent room options for families through mostly chain hotels. A fair number of these rooms are sold on Priceline. You're less likely to find street artists and cozy cafes in this area, but if you only need a place to shower and sleep, it's worth checking on possibilities here. As for the proximity to central Paris -- an RER train runs between La Défense and CDG Station in about 10-15 minutes. Street scams are a problem in any city with an abundance of tourists, and Paris is no exception. As readers post street scam experiences, a number of them involve crowded Paris train stations, ATM card skimmers and more. Pickpocketing is a problem here. Use a money belt if at all possible and don't allow your attention to be diverted by teams of criminals who will split the take if they manage to extract your money. If you need help, ask someone in an official capacity. Beware of people who offer unsolicited assistance. They might not have your best interests in mind. Visiting London? Don't Make These 8 Common Mistakes!